Me & My Big Ideas Boxed Album Kit 12"X12"
Me & My Big Ideas Boxed Album Kit 12"X12" - ME & MY BIG IDEAS-Boxed 12x12 Album Kit: Life Is Good. 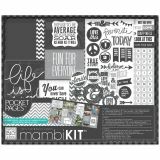 Enjoy a fun and easy way to scrapbook your favorite memories with a Pocket Pages box kit. This package contains one 12X12 three ring scrapbook album, six 3X4 specialty cards, fifty 3X4 themed cards, thirty 4X6 themed cards, ten 12X12 page protectors, 142-paper stickers, thirty-one clear stickers and fifteen chipboard stickers. Imported.